Limestone meets ecological goals on the streets of Paris. When a French urban revitalization project required a sustainable edge, the builders found it … in stone. The recent reconstruction of an in-fill building by the Paris architectural firm of Barrault Pressacco utilized limestone – and lots of it – to blend in with local architecture and meet low-energy-consumption goals for its residents. Located at 62 rue Oberkampf in the 11th arrondissement (administrative district) of Paris, the site previously housed the Hotel Basfroi, which closed in October 2010. The new 13,000 ft², five-story building would house 17 social-housing units and a street-level shop. 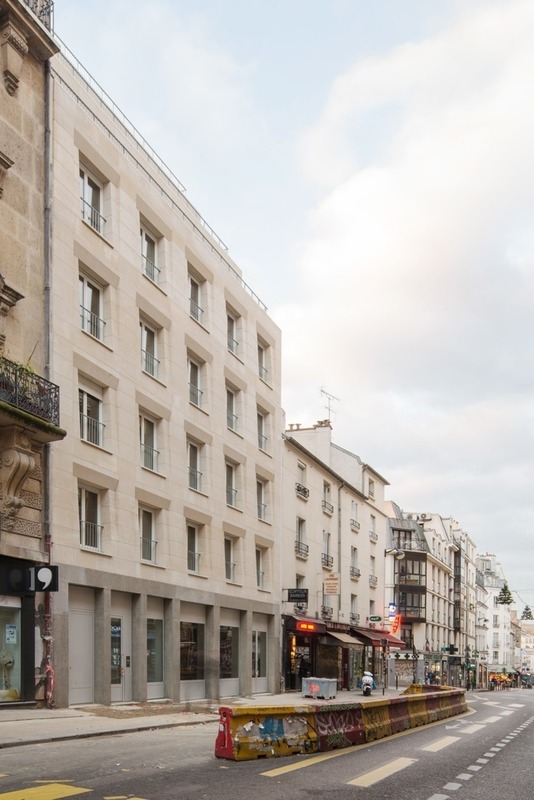 Architects Thibault Barrault and Cyril Pressacco chose stone for the building’s exterior to complement much of the area’s style of Georges-Eugène Hausmann’s 19th-century renovation of Paris. The Hausmann influence, with wide boulevards lined with limestone façades, is the quintessential image of Paris. They didn’t skimp when it came to massive. The project used 380 tons of Brétignac limestone. While the stone widths averages 130cm (51 ⅛”), the thickness of the stone façades varies depending on its elevation, with 35cm (13 ¾”) on the first level and 30 cm (11 ⅚”) on the floors above. The solid load-bearing stone façade rests on reinforced concrete terrace that forms the ground floor. On upper stories, the stone is incorporated into a metal framework to ease the load on the walls. The stone covers more than the street front -- it provides the back walls for the residential units. The design features a staggered balcony plan, providing for a more-open courtyard and more exposure of the stone. However, it’s the energy-saving qualities of the stone that stands out as the project’s highlight. The architects worked with the engineering and thermal design office LM Ingénieurs to design an insulation system using hemp concrete made from hemp shives and lime. The mixture (also called hempcrete) is often used in France; it can’t be load-bearing like standard concrete, but it’s less-brittle and works well for insulation. Hempcrete captures water vapor and can covert it into residual heat, while the stone is a solid barrier against the cold outdoors. The building earned a level 3 Biosourcé certification for using bio-sourced materials, a Bâtiment Bas Carbone Association (BBCA) label for low-carbon construction processes, and a Certification Habitat & Environnement, Option Performance from the city of Paris. Special thanks to v2com newswire for its assistance with this JobSight.